Vascular anomalies such as AVMs are an important cause of intracerebral and subarachnoid haemorrhage. They tend to be seen in younger patients. There is a general incidence of 20-50 per 100,000. They are found on brain imaging in asymptomatic patients in 1 in every 2000 MRI scans. The risk of bleed is higher in than those who have previously bleed than in asymptomatic AVMs picked up on imaging. It is probable that AVMs develop during embryonic or fetal development and are usually present at birth. One suggestion is that they may develop around the 29th week of gestation from remnants of vessels between arterial borderzones. An arteriovenous malformation is made up of an arterial to venous tangle of vessels which are neither arteries or veins but without the usual intervening capillary bed which protects the venous side from exposure to systemic blood pressure. This causes increased arterial flow unimpeded by the usual vascular resistance and increased venous outflow. This misdirection of arterial blood can lead to a steal phenomenon from localised brain. Imaging needs to look at the AVM and surrounding brain. The central coil of vessels is called the nidus. A high pressure within the nidus of the lesion is associated with an increased risk of bleeding however usually AVMS are regarded as high flow and low pressure in part due to the absence of a capillary bed and low vascular resistance. They can be found anywhere in the brain as well as the spinal cord and dura and surface of the brain. Here we will focus on those in the brain (bAVMs). The main concern is that they lack the normal steady reduction of blood vessel size and the normal fall of vascular pressures across the vascular bed and so the venous side is exposed to higher arterial pressures resulting in damage and haemorrhage and oedema. 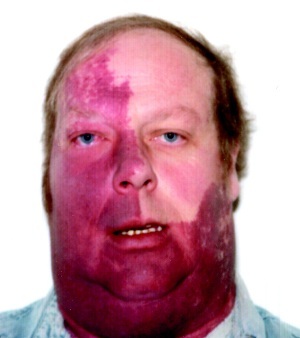 10-25% of people with hereditary haemorrhagic telangiectasia will have at least 1 bAVM. Other than that familial and genetic predisposition to AVMs is very rare. They are usually silent though they can cause focal and secondarily generalised seizures and TIA like episodes and headache. Very rarely large superficial AVMs may produce an audible bruit which may be audible to patient and doctor. Present with acute haemorrhagic stroke with headache and focal signs or subarachnoid haemorrhage with a thunderclap headache and neck stiffness and coma. 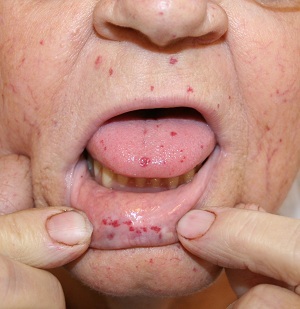 Hereditary haemorrhagic telangiectasia is an autosomal-dominant vascular disease and the most common genetic cause of bAVMs and so it can be useful to look for cutaneous and other manifestations of this. The Spetzler-Martin Grading System assigns a score of 1 for small AVMs (< 3 cm). The eloquence of adjacent brain is scored as either non-eloquent (0) or eloquent (1). The venous drainage is scored as superficial only (0) or including drainage to the deep cerebral veins (1). Scores for each feature are totalled to determine grade. Class A combines Grades I and II AVMs. Class B are all Grade III AVMs. Class C combines Grades IV and V AVMs. 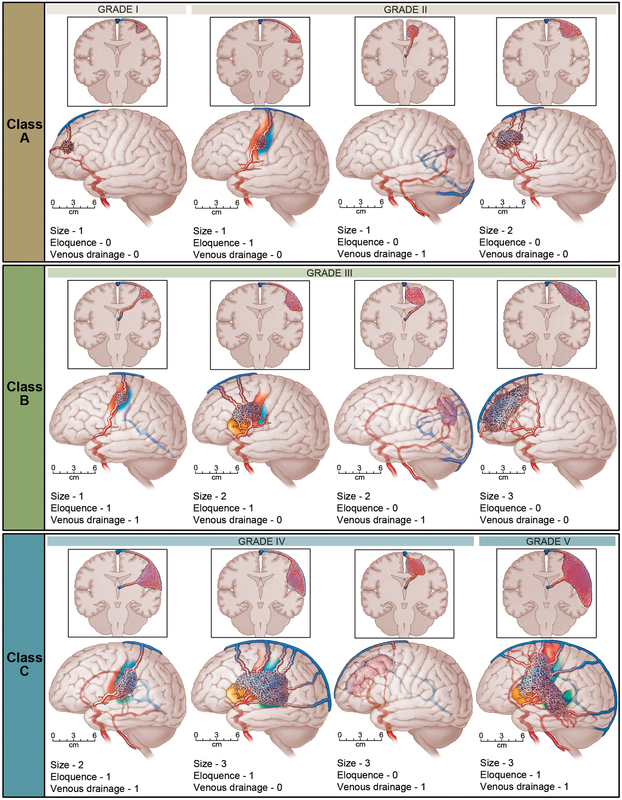 The Spetzler Martin Grading Scale estimates the risk of open neurosurgery for a patient with AVM, by evaluating AVM size, pattern of venous drainage, and eloquence of brain location. A Grade 1 AVM would be considered as small, superficial, and located in non-eloquent brain, and low risk for surgery. Grade 4 or 5 AVM are large, deep, and adjacent to eloquent brain. Grade 6 AVM is considered not operable. CT/A: In those without haemorrhage a non-contrast CT can demonstrate enlarged or calcified vessels. There may be increased density corresponding to the vascular nidus. Once they bleed with SAH or ICH then CT is over 90% sensitive. Large AVMs can be about 3-5 cm in size and can exert a mass effect. Many however are asymptomatic. Paradoxically small AVMS can have a higher risk of bleeding. Imaging is useful. Follow up scanning at 2-3 months is usually part of the post recovery follow up of patients following ICH and once the haematoma has resolved evidence of an AVM which may still exist can be seen. MRI/A: useful and will show up the vessels and a draining vein and can show evidence of prior bleeding and generalised structure and oedema. The detection of old haemorrhage by susceptibility-weighted imaging is associated with increased risk of ICH. Digital Subtraction Angiography:is the gold standard with the best resolution to detect and determine the anatomy. Imaging questions will be location and size. Identification of the feeding artery and the draining vein. If not available then CT angiography may also be done. Acute care is either on a stroke unit or an ITU where management is similar to the generic care of those with haemorrhagic stroke. Management is controversial and depends on assessment of the risks of bleeding weighed against the risks of intervention. It is quite possible that undiagnosed AVMS are the cause of what is often misdiagnosed as primary ICH only that the act of haemorrhage and resultant haemostasis and destruction of the local architecture has destroyed the lesion. For those with a diagnosis the aim of treatment is complete elimination of the nidus and the arteriovenous shunt. Partial nidal obliteration does not appear to reduce risk of haemorrhage. Occasionally bAVMS are picked up on brain imaging for other reasons and there is no evidence of previous bleeding. There is a quoted annual bleed risk of 3% but there is a great deal of variability with much higher and lower values for some groups. Risk of bleeding are shown in the table below. There does not seem to be an increased risk of bleeding in pregnancy and puerperium. Seizures are commoner in younger age, temporal and frontal location, superficial or cortical involvement, and nidus diameter >3 cm. 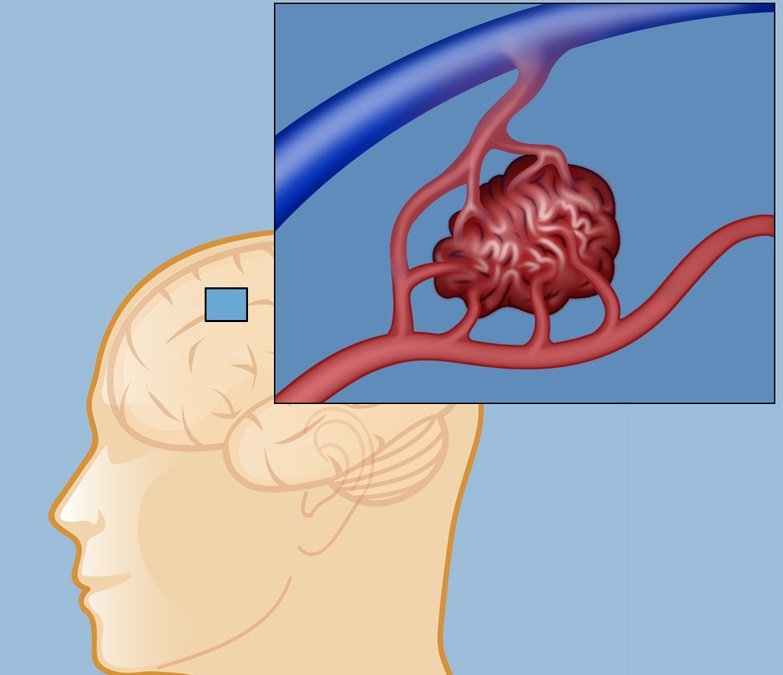 A landmark trial the first randomized trial of intervention for unruptured bAVMs, the ARUBA trial (A Randomized Trial of Unruptured Brain Arteriovenous Malformations) has shown that there is a cost to intervention. ARUBA recruited 226 adult patients (≥18 years old) with unruptured bAVMs between 2007 and 2013 and randomly allocated them to medical management alone or medical management with interventional therapy (e.g. resection, embolisation, or SRS alone or in combination). The data showed that after a mean follow-up of 33 months, the risk of stroke or death in the intervention group (30.7%) was >3 times higher than in the medical management group (10.1%). This and other similar studies may not appreciate the lifelong risks of non-treatment and there is no evidence that risk of haemorrhage falls over time. The trial has been well discussed here. If none of these then bleed risk is 1%, score =1 risk of bleed is 3-5% annually, +2 is 8-15% annually. +3 is over 30% risk. Saccular aneurysm on the feeding vessel is another risk. Surgical resection may be possible. This will depend on the size and likelihood of bleeding and the surgical accessibility of the lesion. The neurosurgeon will clip of the lesion and then remove it. AVMS that are deep are more difficult to manage surgically. Endovascular embolisation. Either an interventional neuroradiologist or neurosurgeon will access the cerebral circulation though a femoral catheter. The feeding arteries of the AVM are identified and embolised with particles, a coil or a glue like substance e.g. N-butyl cyanoacrylate or EVOH . This can either reduce or totally block arterial blood flow. If the feeding arteries supply other structures then embolisation has the risk of causing stroke. Stereotactic radiosurgery (SRS). Radiotherapy can be used to treat deep lesions with an intention to cause thrombosis of the lesion. Radiation-induced necrosis, oedema, and cyst formation can develop long after treatment. The aim is to destroy the AVM. Highly targeted radiation beams are directed at the AVM to damage the blood vessels and cause scarring. Over time the AVM clots off. There is endothelial damage and the benefits may not be evident for years. Radiation induced changes seen on MRI as T2-weighted MRI hyperintensities around the nidus have also been associated with eventual nidus obliteration. Conservative management: For many patients with no history of haemorrhage AVMS may be left alone. The risks of intervention can outweigh that of surgical intervention. Unruptured bAVMs: Patients should be informed about natural history risks, which are reliably quantified over ≈10 years for ICH and ≈5 years for epileptic seizure. The annual risk of a first-ever ICH from an unruptured bAVM is about 1%. Prognostic factors that modify this risk are uncertain. The 5-year risk of developing a first seizure for people with an unruptured bAVM is about 8%, and the 5-year risk of developing epilepsy after a first seizure is 58%. The discussion of treatment options with patients should include consideration of these risks weighed carefully against the relative risks of different intervention strategies and life expectancy. Mohr JP, Parides MK, Stapf C, Moquete E, Moy CS, Overbey JR, Al-Shahi Salman R, Vicaut E, Young WL, Houdart E, Cordonnier C, Stefani MA, Hartmann A, von Kummer R, Biondi A, Berkefeld J, Klijn CJ, Harkness K, Libman R, Barreau X, Moskowitz AJ; international ARUBA investigators. Medical management with or without interventional therapy for unruptured brain arteriovenous malformations (ARUBA): a multicentre, non-blinded, randomised trial. Lancet 2014;383:614-621.